Is a flat roof actually flat? No. For clarity, flat roofs actually have a slight slope to allow rain water to drain off the roof, but they seem flat, when compared with more traditional steeply sloped roofs. The slope should be a minimum of 1 in 80, but in practice a minimum slope of 1 to 40 should be used to allow for deflection of the roof and for normal building tolerances. Why are flat roofs popular? Flat roofs are economical to construct. They reduce the volume of the building thus reducing energy costs and allow, if required, for the roof to be used for other activities like a patio, positioning of services or simply as a green roof. How long do waterproofing membranes last? The membranes used to cover and waterproof flat roofs usually only last 20 to 30 years. This is less than a well constructed tiled roof. As a result building owners need to plan for replacing the membrane on their flat roofs. What maintenance is required? Regular maintenance of flat roofs is still required, as they are less forgiving than steeply sloped roofs. The most common problems are that rainwater outlets become blocked with leaves and other windblown debris. Installing leaf guards only slows this occurring as in my experience at this time of year, autumn, even these can become overpowered by the shear quantity of leaves being blown around by the wind. When a roofer is engaged to do the work, ensure they have the experience, skills and insurance to carry out the work. References should be checked and an engineer, or architect, engaged to specify, detail and inspect the work. The detailing at design stage is very important. A common area which needs to be designed and constructed properly is the joint between the flat roof and any parapet wall. Unless it is detailed to allow for movement any slight deflection of the roof could cause a break in the waterproofing membrane at the roof/ parapet wall/junction. Try to avoid having internal outlets and if these are unavoidable insulate them where they penetrate the warm roof to avoid cold bridging and possible condensation forming on the pipe. Allow for more than one outlet to drain an area, in case of blockages. Provide leaf guards to all outlets and regularly inspect them to ensure they are not blocked. Ensure the roofs can be safely inspected, with easy access to the roof and fall arrest systems in place to protect inspectors. This is to prevent injury but it will make it more likely that the roof will be inspected if it is easy and safe to do so. Inspections should never occur during extreme/ poor weather conditions. When positioning roof-lights or ventilation chimneys ensure there is sufficient space between them and other obstructions (e.g. parapets) to allow the installation and inspection of the roof membrane. Actual example of problems. 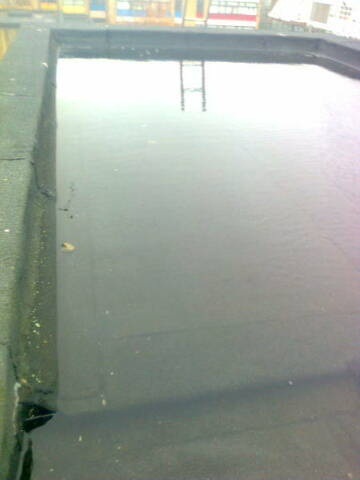 See the photograph below for what can go wrong; this was a section of school roof which I recently inspected where there was a leak. The roof is covered to a depth of 100mm with water and resembles a swimming pool because a rainwater outlet was blocked by a football. The parapet walls prevented the water over spilling the sides. 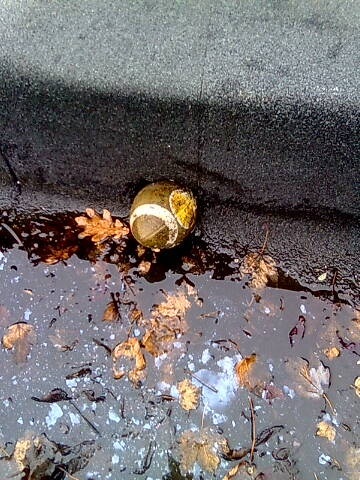 Originally there were leaf guards installed to prevent footballs jamming rainwater outlets but it was thought by the school that these were kicked off by kids who have a habit of climbing onto the roof. I removed the football and the resultant rush of water down the drain was nice to experience as it is rare that problems with buildings can be this quickly resolved. There are a few lessons from this example. 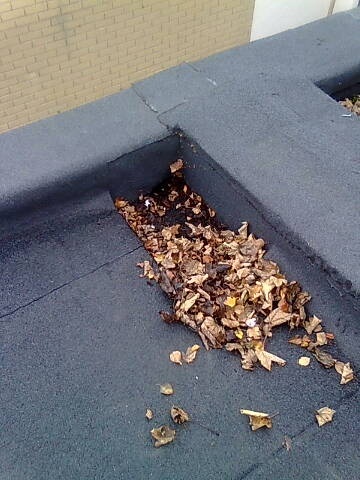 All flat roofs should be regularly inspected to prevent this type of blockage occurring and leaf guards should be well secured. The next photograph shows the same school roof with in this case leaves building up and beginning to block the drains in another area. These should be cleared out during a regular maintenance schedule. Obviously anyone carrying out the roof inspections should take all necessary precautions against falls, and have the assistance of another person in case of problems. A perfect shaped ball for blocking roof outlets. Turn off your fog lights when there is no fog! This is a great article with wonderful photos that illustrate issues. Regular maintenance of a flat roof is critical to the overall performance and lifespan. In addition to footballs and leaves, flat roofs can experience issues when rodents or birds use drainage areas for nesting. Using a shop vac to remove debris on regular basis can easily prevent many expensive problems, such as the unintentionally creating a roof-top pool. I am really impressed together with your writing skills as smartly as with the layout in your blog. Is this a paid topic or did you customize it your self? Either way keep up the nice high quality writing, it is rare to look a nice weblog like this one these days.. Thanks, on a related note, I own a flat the is a house split in two flats, the roof is leaking into my flat and i made downstairs aware 6 months ago and got some quote, the cheapest being £950, they have agreed it is joint responsibility but is now saying they cannot afford to pay half so it cant be done. It is leaking in and ruining my walls what can i do if they cant afford half and i cant afford to pay for all of it and shouldn’t have too either. Sorry to here about that. From an engineering point of view the leak needs to be fixed as soon as possible. The longer you leave it the more damage will be caused. Not being able to get the other building owners to pay their share is a legal matter really. But surely they signed a contract for dealing with these types of shared issues? You might have no choice but to fix the leak first and try and get their portion later via legal means. But again you need legal advice on this. I have a flat roof and water keeps overflowing over the back portion of my house. Downspouts are not clogged, edge trim was installed last year. Trim was holding up for a whole year but the water keeps overflowing and spilling all over my bilco door and it is causing havoc on my basement walls! I have contacted various contractors and they have told me that gutters would not be a good option. Please I need someone’s help! It’s truly quite astonishing how little thought many people give to ongoing maintenance of dry roofs; both in terms of ensuring outlets are clear and additionally on ensuring the roofing materials are in good condition. Too many people only discover problems with leaks and damp once winter sets in. A far smarter idea is to make it part of your end-of-summer routine to inspect your roof – or have a professional do so – to avoid the risks of leaks and water damage during the wetter months. What a good read! I find this informative and I do agree that flat roofs should be maintained regularly. Waterproofing techniques such as torch on membrane should be applied by qualified waterproofers. I live in a top floor housing association block of flats,the freeholder of the building has a poor track record in the maintenance of the flat roof which allegedly gets cleared of any foliage and to clear the guttering,but I now have mould and damp coming through in ceiling and wall cornering. Trying to get access myself to photo and video the condition of the roof is off limits due to health and safety concerns,the amount of growing and fixed foliage that is on the roof has been a cause for concern for many years,it now seems the problem is getting worse,with a lack of urgency with the housing association. So many very true ideas in this article, a well designed roof and a good installer are essential to a flat roof last many years with no issues. Keeping details at a minimum and roof design simple is very important to keep water on of a building with a flat roof, too many details create opportunity for weakness. Often using a company with certified installers for their product is also a good idea, this way you know that they understand the product and have been trained to install it, is also gives you assurance, as product warranty will sometimes only be valid if installed to the suppliers instructions. 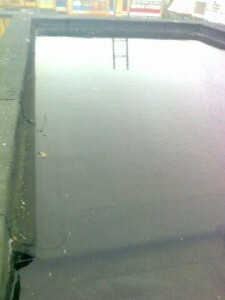 Flat roofs can be a problem for building owners if not properly maintained! You should inspect your flat roof at least twice a year or more to keep it clean of trash so it won’t stop up your drains. If you don’t have someone that can do this contact a professional commercial roofer to help out. That’s really good detailed information we get to read here about flat roofs along with their designing and maintenance tips. We should also look out on few other roofing problems which include tree damage, faulty roof flashing, roof punctures, membrane shrinkage, blocked gutters, poor ventilation, water damage etc. I find this blog thoroughly insightful – thank you. I have a top floor flat of a Victorian terraced house split into two flats. The property has a smaller flat roof at the rear of the property. We have a ceiling extractor fan and there is a vent pipe that the developer installed when the flat was converted. I have now had two roof leaks, both coming through the extractor fan and have had roofing contractors inspect it. They have confirmed that pools are forming near the vent pipe and other parts of the roof. I am going to repair the roof and share the costs with the downstairs property – my question is if done properly, can I have a good flat roof vent pipe installed that will give me more years, in addition to the redoing the flat roof? What are the advanced vents out there? Great blog! I am somewhat stuck for ideas trying to repair the flat roof over the back kitchen extension. There is this one water spot developing on the ceiling. Roof relatively new – couple of years or so old. No evident cracks/holes/split in felt flashing etc. either above the water spot or elsewhere on the roof. Any pointers what else I should check? Helpful engineer certainly the name suits as you knowledge of flat roofs has helped me with a couple of potential issues I would have had. Quick question though is there any way of telling how old a flat roof membrane would be if you purchased a property with one? Dont know if there are any obvious signs I should replace it.